Mort Künstler Hand Signed and Numbered Limited Edition Print:"Respect of an Army"
Image Dimensions: Limited Edition Print Image size: 17" x 30" / Overall size: 22" x 34" Canvas Sizes: 16" x 28" , 19" x 34", 22" x 39" and 32" x 57". Perhaps one of the most touching scenes of the entire Civil War took place at the very end of the conflict. After four terrible years of fighting, the gallant Army of Northern Virginia had sustained great hardships and was unable to recover. Outnumbered, under-equipped and nearing desperation, the Confederate forces reluctantly conceded to their Union counterparts. After communicating through a series of dispatches, General Robert E. Lee and General Ulysses S. Grant agreed to meet to discuss the terms of surrender. The spot for this historic event took place at the McLean House at Appomattox Court House. 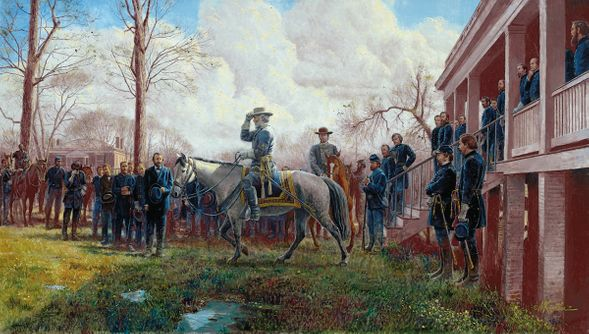 According to the official account of the event, General Grant initiated the conversation by saying "I met you once before, General Lee, while we were serving in Mexico, when you came over from General Scott's headquarters to visit Garland's brigade, to which I then belonged. I have always remembered your appearance, and I think I should have recognized you anywhere." "Yes," replied General Lee, "I know I met you on that occasion, and I have often thought of it and tried to recollect how you looked, but I have never been able to recall a single feature." While the animal was being bridled the general stood on the lowest step and gazed sadly in the direction of the valley beyond where his army lay - now an army of prisoners. He smote his hands together a number of times in an absent sort of way; seemed not to see the group of Union officers in the yard who rose respectfully at his approach, and appeared unconscious of everything about him. All appreciated the sadness that overwhelmed him, and he had the personal sympathy of every one who beheld him at this supreme moment of trial. The approach of his horse seemed to recall him from his reverie, and he at once mounted. General Grant now stepped down from the porch, and, moving toward him, saluted him by raising his hat. He was followed in this act of courtesy by all our officers present; Lee raised his hat respectfully, and rode off to break the sad news to the brave fellows whom he had so long commanded. The reverence and awe exhibited by the victors spoke directly to the character and reputation of their former enemy, who had risen against the odds time and time again to achieve success on the battlefield. Despite feeling an overwhelming sense of relief that the war was over, no one that day took pleasure in Lee's personal defeat. Despite the circumstances that may have separated them, the soldiers who had fought so hard against one another shared a mutual respect that represented the first step toward reuniting the country. My all-time favorite Civil War painting is the surrender scene painted for National Geographic's April 1965 issue. It shows Robert E. Lee signing the peace treaty in the parlor of the McLean House. The compassion and respect of General Grant and the Union officers in the room is apparent and very moving. What makes the painting even better are the likenesses of all the characters in the scene. This is an incredibly difficult chore for an artist, and my late friend Tom Lovell (1909-1997) made the painting a tour de force for his talents. I've known for some time that I would do an Appomattox surrender scene for the 150th anniversary of the event. The problem was I did not know exactly what I would paint. I always like to do something that no one else has done, and Appomattox has been painted thousands of times by hundreds of artists. Since I had already done a painting of Lee riding back through the Confederate lines after the signing - and I certainly was not going to attempt to do the same scene that my friend and idol had done so masterfully - that left me with Lee departing the McLean House and passing through the lines. While many artists have painted that event, none that I know of have ever shown the McLean House and Appomattox County Courthouse in the same scene. By walking around the property and studying maps I came up with a viewpoint, which does just that. I attempted to emulate Tom Lovell by trying to capture the likenesses of as many of the people as possible that were verified to have been there. Chief Historian Patrick Schroeder of Appomattox Court House National Park was of immeasurable help, supplying photos, maps, and drawings, and helping me solve the various problems that came up during the work on the painting. I can only hope that you, the viewer, enjoy this painting as much as I have enjoyed looking at the Lovell work. I would like to show the photos and eyewitness sketch by Alfred R. Waud that I used for this painting. Have fun identifying the individuals. No thank you, I just want the 17x30 SN unframed print.